Make Money by Watching TV – Use Viggle! Right now I am doing the unthinkable: watching football when AlmostHusband isn’t even home. Why would I be doing such a crazy thing? It’s not for love of the game, because I’m at best mildly interested in football in general. I’d rather watch Love It or List It on HGTV given the choice. No, I’m watching football because I am earning Best Buy gift cards as fast as possible so that this holiday season I can buy either a new giant TV…or, more practically, a new dryer and possibly a Surface Pro 2. The way I’m earning these Best Buy gift cards is by using Viggle, an app for iOS and Android devices (sorry Windows phone users, hopefully your time will come soon) that rewards you for WATCHING TV. Yeah, it’s the best app ever. When you’re watching a show, you just “check in” with Viggle (it uses the audio from the show to tell what you’re watching) and you get 1 point for every minute you’re checked in. There are shows that have bonus points for watching, there is trivia that you can play along with for extra points, there are ads that you get points for watching, and there is a game called MyGuy which is sort of like fantasy football – you pick your player and get points when he does something good. That is why I’m bothering to watch football: it’s easier to get MyGuy points when you actually know what’s happening during the game. 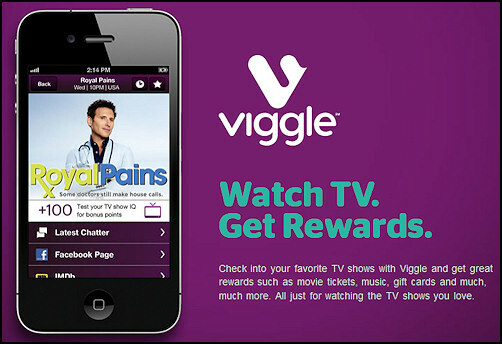 Viggle points can be redeemed for gift cards. The types of gift cards available varies, but you can regularly rely on Best Buy gift cards popping up. (Also reliable: iTunes, CVS, JCPenney, Lowes, Papa Johns, Groupon) It takes 62,500 points to get a $25 Best Buy gift card. That might seem like it would take a long time…but really you just have to know how to maximize your points. In the past four months, I’ve earned $150 in Best Buy gift cards…not too shabby when you consider that it’s just money for watching TV! What constitutes a day: midnight to midnight, EST. (If you’re in Arizona, keep track of whether we’re on Pacific or Mountain time. We’re on Pacific right now so a day goes from 9:01 PM to 9:00 PM. When we’re on Mountain it’ll be 10:01 PM – 10:00 PM. So how do you ever get up to 6k if you can only get 720 for watching stuff? 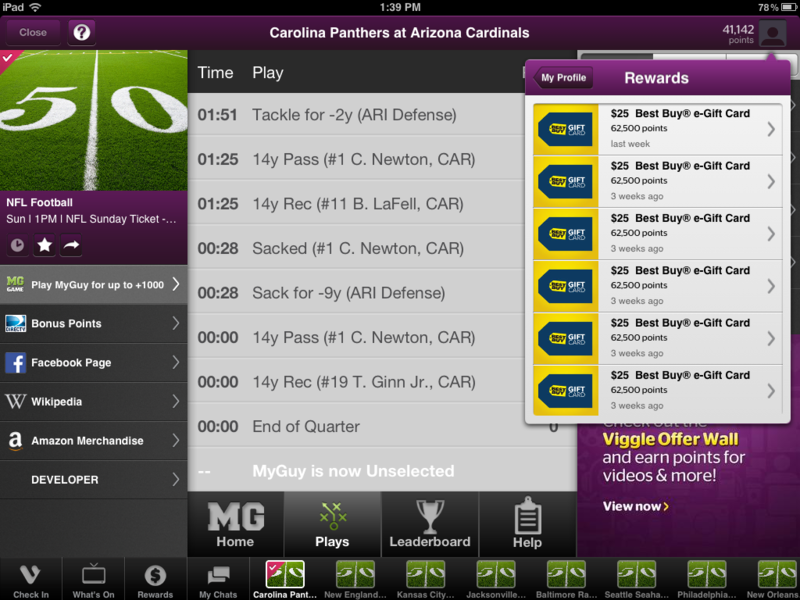 Play along with MyGuy during football games whenever possible. You can get up to +250 per quarter. Even if you don’t do well with picking your guy, sometimes ads pop up during the game that are worth a lot so it’s worth playing even if you don’t know what you’re doing. Amount of time you need to be checked in to get bonus points/qualify for streaks: 10 mins – if there’s a really busy schedule within an hour, I recommend setting the timer on your device for 10 mins so you can check into as many shows as possible. Sometimes the app won’t recognize the audio of a show you’re watching. When that happens, it will try 3 times then have you type in the name of what you’re watching. This is called manual check-in. You can manually check into any show as long as it isn’t over an hour long. The only exception to this is sports games. You can manually check into those. When there is a bonus for renting a movie through DirecTV On Demand, if you can find a clip of the movie on YouTube, sometimes you can check in that way. I think it’s officially against Viggle’s terms of service but I’m not sure how they would know. I of course never do this and am not officially recommending it. This may or may not also work for commercial bonuses that pop up. You don’t necessarily have to check into the live airing of a show in your time zone. For instance, sometimes there’s a LOT of shows with bonus points during the 7PM prime time hour. But you may notice that in Viggle, it says that they start at 5 (if they’re on a network: NBC, CBS, ABC, CW, Fox). You can manually check in to some of those shows at 5 PM and the rest at 7 PM when they’re actually on. This also keeps your points on one day when you’re on West Coast time. Along the same lines as the point above, if there’s Viggle Live for a show, you can start playing whenever it’s live on the East Coast. That will let you get more VL questions in. UPDATE: Viggle Live questions will cycle through for every time zone the show is on, so if you don’t know the answer to a question, just don’t answer it. Wait until the time runs out and they’ll show you the answer. Then play again during the next time zone’s showing and you’ll have the right answer! If possible, I recommend using it on a tablet more than a phone. As you can see in the screenshot above, you can easily switch between shows you’ve checked into at the bottom…which lets you play more than one Viggle Live game or MyGuy game at a time. You can still do that on a phone, but you have to keep exiting out of one show/game and getting into another and it’s not very efficient. I think that pretty much covers all you need to know to get started. Let me know in the comments if you have a question about the app that I didn’t mention above. How cool is it that you can get money just from watching TV?? I am so in love with this app!